Overwhelming empirical evidence indicates that new social workers, particularly those going into child welfare or other trauma-related care, will discover emotional challenges including the indirect or secondary effects of the trauma work itself, professional burnout, and compassion fatigue. However, the newly revised CSWE Educational Policy and Accreditation Standards (EPAS) does not mandate the inclusion of content related to self-care in social work curriculum or field education. In a textbook that bridges the gap between theoretical and pragmatic approaches to this important issue in human service work, Jason M.
Newell provides a potential resolution by conceptualizing self-care as an ongoing and holistic set of practice behaviors described as the key to professional resilience. 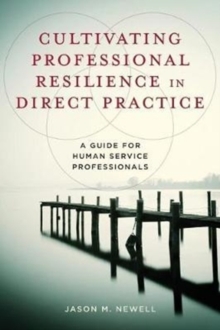 To address the effects of trauma-related care on direct practitioners, Newell provides a comprehensive, competency-based model for professional resilience, examining four key constructs-stress, empathy, resilience, and self-care-from a range of theoretical dimensions. For those who work with vulnerable populations, the tendency to frame self-care solely within organizational context overlooks the importance of self-care in domains beyond the agency setting. Alternatively, he uses a framework grounded in the ecological-systems perspective conceptualizing self-care as a broader set of practice behaviors pertaining to the whole person, including the physical, interpersonal, organizational, familial, and spiritual domains of the psychosocial self. Alongside professional self-care practices at the organizational level, Newell makes a case for the pragmatic role of recreational activities, time with family and friends, physical health, spirituality, and mindfulness. The application of a comprehensive approach to self-care practice has potential to empower practitioners to remain resilient and committed to the values, mission, and spirit of the social work profession in the face of trauma.